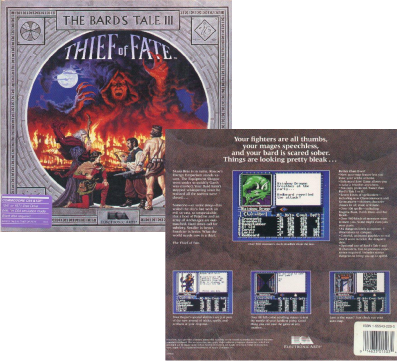 The third and final Bard's Tale game, The Bard's Tale III: The Thief of Fate was released by Interplay Productions in 1988. Unlike the first two games, Thief of Fate was not written by Michael Cranford. Thief of Fate was available for the Commodore Amiga, Apple II, Commodore 64, and MS-DOS. The Mad God, Tarjan, has unleased destruction on the city of Skara Brae and the surrounding lands. Your party must travel through seven dimensions to find the source of the destruction. You must then destroy Tarjan himself. The Mad One's kin destroyed the site. It did no good, the streets ran red. How did it come to this? We thought Tarjan had been vanquished, but we only made him angry. Angry and mad makes a bad combination. Garth, Roscoe, Kylearan.. 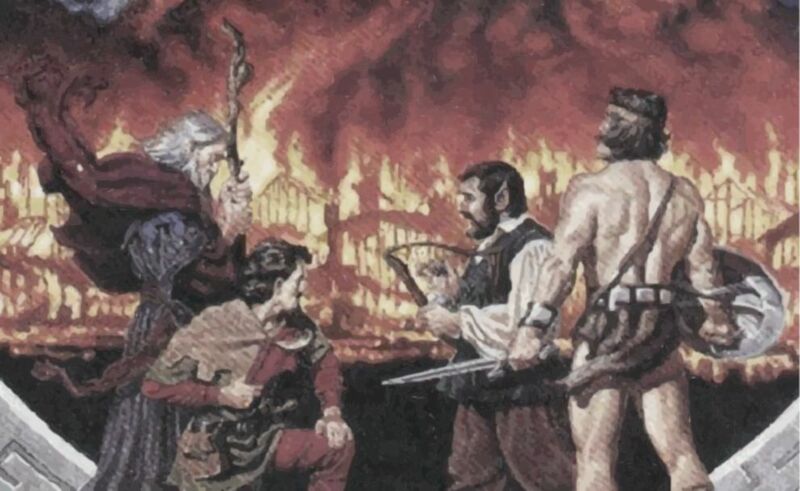 Indeed the entire city of Skara Brae is destroyed, having bathed in fire. We find ourselves in a refugee camp outside the ruins. Even we who have faced so much, what can we do? Attempting to drink away our woes at the Scrapwood Tavern, the Bartender chides us. "Go to the old review board. See the old man. He's expecting you." We wander into Skara Brae, dazed by the destruction, and wander across the Grand Plaz. The Temple of the Mad God stands, untouched, unlike the destruction around it. Skirting past, we visit The Old Man. He tells us that the world is on course of destruction, and we must follow his instructions to avoid the worst. We're sent into the Temple once again, this time to destroy its high priest, Brilhasti Ap Tarj, who thwarts the Old Man's plans. This we do. Having defeated two great evils already has prepared us for this sort of thing. The Old Man teaches one of our Mages the rites to renounce Archmagedom forever. Henceforth, a Chronomancer, he will send us to the dimensions needed to rouse the epic heroes of legend needed to defeat Tarjan once again. We are sent to Arboria to retrieve Valarian, or if he will not come, his bow and arrows. Upon arrival, we discover there is a problem; Valarian is dead. 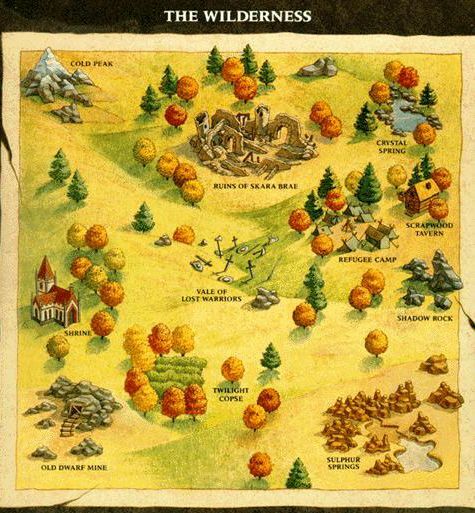 The King of Arboria is unsympathetic and requires the killing of Tslotha Garnath. An acorn, water of life, and a Nightspear later, we collect the head of one Tslotha Garnath, and showing that to the King, gain access to the tomb of Valarian. Returning with the items, the Old Man collects them, empowers us and sends us on our way to Gelidia. This is a land of Mages, and we are to fetch the greatest known, Lanatir, to aid us. Upon arrival, Gelidia is so cold that we nearly die before reaching the limited shelter of the Ice Keep. A journal reveals that the the mages were under such unstoppable assault that they sealed away the Crown and Sphere and set a spell of eternal cold to attempt to force out the assailants, while dooming themselves. A strategy which seemed to have failed since the place remained crawling with foes. We collected three lenses from the mage towers to work a strange mechanism, gaining access to Lanatir's tomb. We gave the name of his blood, and brought the artifacts back through time to the Old Man. The Old Man, losing hope that Alliria might yet live, sent us to Lucencia to collect her belt and crown. Indeed, she had been killed by the forces of Tarjan months before we arrived, and that had driven her lover Cyanis quite mad. A killed dragon, a healed Cyanis, and several roses later, we gained entrance to the inner chamber of her tomb, and returned with the items of power. Weakened by the news of another death, the Old Man sent us to Kinestia, where he knew by certain arts that Ferofist the Dwarf was still alive. He required the Hammer of Wrath and Ferofist's helm. Surely this time we could bring the hero intact with the items? We arrived underground to find a war raging between the dwarves and strange mechanical clockwork creations. And the dwarves were losing. Ferofist was found mortally wounded and fading. He blamed himself for making a foul deal with Tarjan to breathe life into his creation. The clockworks were the children of the dwarves. He had created a being Urmech, which he expected to serve the Dwarves, but gave it independent thought and it did not choose to do so. Somehow tempers rose and a war broke out. Unexpectedly, Urmech's ability to create more creations endlessly meant that they would win. With his dying breath, Ferofist called upon us to unmake Urmech. We were sent down into Urmech's lair to destroy the thing. After many tribulations, we cornered it, but it spoke and asked "Why?" Why must there be conflict? Must it end in violence? We were moved, and our weapons were put away. Urmech taught us the new magic of Geomancy, and gave us the items that the Old Man had required. Trembling from the news, the Old Man sent us to Tenebrosia, a dark place where Sceadu lived, chief among those who use stealth and secrecy to achieve their aims. A shadow lock and a shadow door, together retrieved, gave access to Sceadu's demens, and entirely off the map we found him alive and well. Finally a hero who might return intact. Sceadu however, flatly told us that we would not have the items, and we would not have his help. The coldness in his eyes told us he was now our enemy. A long fight, and bitter -- in the end Sceadu called out Tarjan's name and cursed him for having made Sceadu his pawn. Sceadu's Cloak and the Helm of Justice were returned to line the Old Man's closet, for whatever good it might do. Upon the news of Sceadu's betrayal, the Old Man cried out in anguish. Returning to clarity, he sent us off to Tarmitia, the land of unceasing warfare, where time is knit together strangely between pockets of strife. We were to fetch the Strifespear and Werra's shield from Werra himself, the icon of War. Some things we saw, we did not understand: men in armor made of cloth welding tubes that spat fire; a wasteland huddling under a sky of dust and a fierce glow in the shape of a mushroom. Through the holes in time we tumbled, learning the names of War: Ares, Mars, Yen-Lo-Wang, Senozic, and a thing SDI - ICBM that seems to be a machine that people worship in the future. We named the spirits of carnage hovering over those battlefields, and they led us inexorably to the domain of Werra. Cornering him, he attacked us with all his might and rage. We used all our power and bested him. And then, he sat up in his pool of blood, and laughed. "That was great fun", he said, "you've earned the right to bear the shield." It seems the Hero of War was hardier, and friendlier, than we thought. But before the friendship could be enjoined, Black Slayers sent by Tarjan came and destroyed him utterly. Fleeing back to the Old Man, we found that he too, had been mortally wounded by Tarjan. He told us to take the artifacts that we had collected, and that we must now be the heroes of legend to defeat him, or all would be lost. To the home dimension of Tarjan we went, the land of EVIL. A twisty maze of teleports, portals, and disconnected regions. None of our travel magic worked, and the place was immense. Slowly we found a handful of black-ice statues, each one of the heroes of legend. We released the spirits of them all, one by one, and cleared the way to the heart of Tarjan's defenses. Through mighty spells and stalwart shields, we held back the hordes he summoned. And all besides, our thief snuck up upon him, and from behind laid one great strike with Heartseeker, and felled the Mad One. In the process, we had taken the place of the Heroes of Legend, and stars in the sky were set for us. We have earned great powers, and we hope they will never be needed again. Brian Fargo for having the vision to let me begin this project. Michael A. Stackpole for coming up with the basic storyline, the maps and the text found throughout the game. Todd J. Camasta, whose artistic talent knows no bounds. Kurt Heiden who spent many days composing the music that the famous Bards now sing. Bruce Schlickbernd for composing additional text, for the songs sung in the Bard's Halls, and also for finding all those nasty little bugs that seem to create themselves. These people helped make Thief of Fate into a masterpiece of role-playing fantasy. I hope you will enjoy our work.